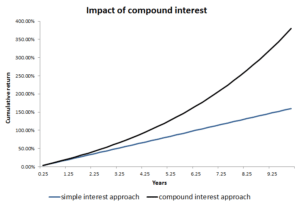 The returns of investments are often expressed in different frequencies. For example, some financial advertisements might report the total return over the duration of the investment. Others financial products might report the average return over the past few years. However, when we want to compare the return of different investments, we need to make sure that they are expressed in the same frequency so that they are comparable. One thing we can do, is to annualize returns. On this page, we provide the necessary formulas that explain how to calculate the annualized rate of return. At the bottom of this page, we also implement all these formulas in Excel to provide a simple annualized return calculator. In that case, the annualized return is 16%. 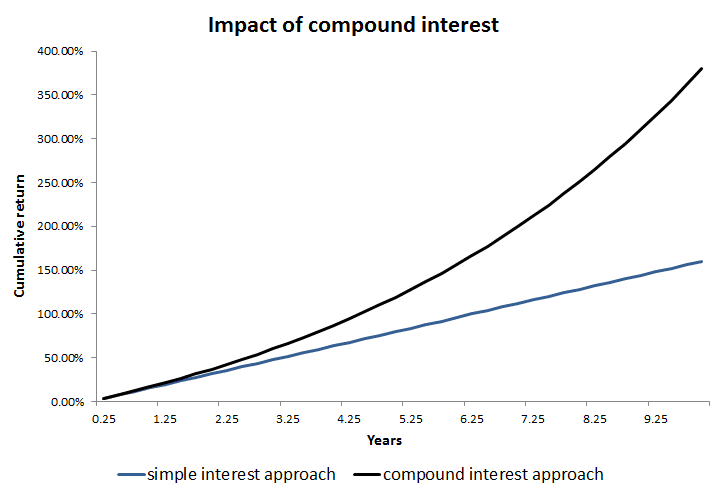 This is referred to as the simple interest. It is important to note that, if you want to annualize volatility, you have to use a different formula. in which case the annualized rate of return equals approximately 17%. The difference between both returns is 1%. This may sound like a small difference, but it compounds to a big difference after just a few years, as the following figure illustrates. We discussed how to annualize returns. This is an important concept as it allows investors toto compare the return to different invesments when they are expressed in different frequencies. Want to annualize returns yourself? Download the excel file: Annualize returns.